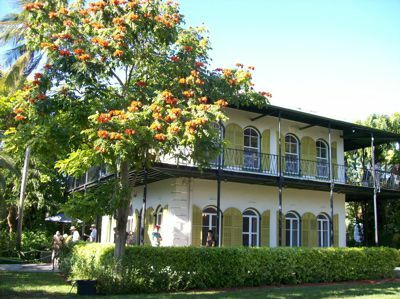 The Hemingway Home and Museum is one of the most beloved historical sites in Key West, and most visitors to the Conch Republic make a pilgrimage to the famous author's former home on Whitehead Street. The museum offers guided tours daily that include highlights of the main house, studio, and grounds. For cat-lovers especially, a big part of the attraction of the Hemingway House is its feline inhabitants, which currently number more than 60. The Hemingway Home cats inspire curiosity in visitors, and tour guides typically field multiple questions about their numbers, habits, and history. 'Cataphernalia' is everywhere you look, including these lace curtains on a back window and pawprints made in wet cement on the back verandah. If this multi-kitty 'cat house' looks familiar, that's because it is a scaled down replica of the Hemingway Home itself. Here's one of Hemingway's cats stepping out for an afternoon stroll. All of the cats have names, with some bearing the monikers of famous friends of Papa like Pablo Picasso and Audrey Hepburn. There's even a 'Hairy Truman' in honor of another part-time Key West resident of certain renown. Cats spend half of their lives sleeping, and the Hemingway Home felines are no exception. At any given time you will find dozens of cats zonked out under trees, beneath sunbeams, and on chairs and couches inside the historic house. Awake or asleep, the cats are quite used to human interaction and most have no problems with being petted by visitors. The Hemingway House cats may have a common ancestor, but most of them are 'mutts' of questionable lineage, and a number of breeds are represented on the grounds. Museum officials note that Key West is a small island, so you are likely to find relatives of the Hemingway cats as you walk around town, including at a number of local restaurants and inns. About half of the cats at the Hemingway Home are 'polydactyls,' meaning they have an extra digit on each of their front paws. This dozing cat shows off his 'thumbs' for the camera -- the original cat given to Hemingway by a sea captain was a polydactyl, and legend holds that they were considered good luck by seafarers. In fact, cats often found work on ships as mousers, and port towns tend to have more than their share of polydactyl cats as a result.